Giant chess magically draws people into this timeless game! Why not consider having our oversize chess sets in your garden or recreation area. From private garden chess to amusement parks, to zoos, museums and resorts. The possibilities are endless! We specialize in custom Giant Chess sets and Chess Boards. We are sure that you will love the beauty and uniqueness of our "solid" Teak Wood Chess Sets! We offer our customers Custom made Giant Chess sets at an affordable price. While we reproduce the classic Staunton look, custom pieces are available and will be carved to client specifications. Our sizes range from 8" King Tall to 72" King Tall. Outdoor Chess for gardens, parks, resorts, hotels, schools, campgrounds, back yard, chess club, decoration and community centres. We have variety size for outdoor playing : from 16" to 72" king tall. Also have 8" and 12" wooden chess for indoor or for table. GiantChess.com is a manufacturer which provides all parts of chess games, like chessman, chessboard, chess desk, chess accessories, etc. 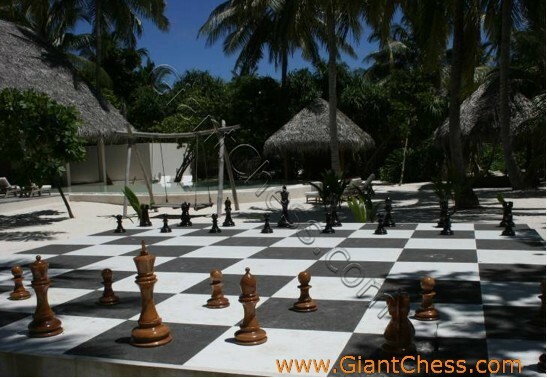 GiantChess.com is located on Java Island, and has been recognized because of the authenticity of its products, carved in original teak.